MÜNSTER -Lutetia Parisiorum urbs, toto orbe celeberrima notissimaque, caput regni Franciae. MÜNSTER, S. - Lutetia Parisiorum urbs, toto orbe celeberrima notissimaque, caput regni Franciae. Lutetia Parisiorum urbs, toto orbe celeberrima notissimaque, caput regni Franciae. 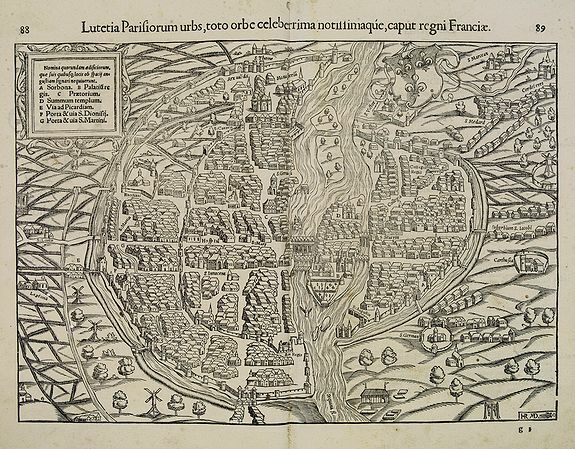 - MÜNSTER, S.
Title : Lutetia Parisiorum urbs, toto orbe celeberrima notissimaque, caput regni Franciae.. Size : 9.9 x 14.1 inches. / 25.2 x 35.8 cm. Description :Early bird's eye view of Paris, called at the time Lutetia. From a French text edition of S. Münster's Cosmographia, which is a short and complete summary of Renaissance knowledge. Condition : Several small worm holes filled in. Double page woodblock print with letter press.